Szechuan Style Chinese Noodles - an easy vegetarian and vegan Chinese food recipe for noodles cooked with green onions and garlic in a unique Chinese Szechuan sauce made from chili sauce, vinegar and sugar and topped off with cucumber and peanuts. When it comes to Szechuan noodles, this easy recipe is actually fairly tame, so toss in some chili flakes, chili oil, or extra hot sauce if you like your Asian noodles with more heat. I love that these vegan Asian noodles have just about every flavor and texture imaginable all in one dish: there's a little bit of sugar to sweeten them up, tangy vinegar, spicy Sriracha sauce, cooling cucumber, crunchy peanuts, savory salty soy sauce, and of course, plenty of succulent noodles! If you need this recipe to be gluten-free, be sure to use a gluten-free noodle, such as bean thread, rice noodles or buckwheat noodles such as soba and swap out the soy sauce for gluten-free tamari or nama shoyu. For the most authentic Asian noodles, you'll want to use thin Chinese egg noodles, but this Americanized and veganized recipe isn't particularly authentic! Udon noodles would also be a good choice of noodle, or, as the recipe suggests, you can use plain old regular spaghetti noodles. Drain well and set aside. You can also use pre-cooked leftover spaghetti. In a large skillet or wok, saute the green onions and garlic in oil for just a minute or two. Stir in the vegetable broth, cornstarch, soy sauce, ketchup, vinegar, chili sauce and sugar, whisking to dissolve and combine the cornstarch well. After 2-3 minutes, add the cooked pasta or noodles, stirring and tossing to combine well. Allow to cook just until heated through and sauce has thickened, then add peanuts and cucumber and heat for just another minute or two. 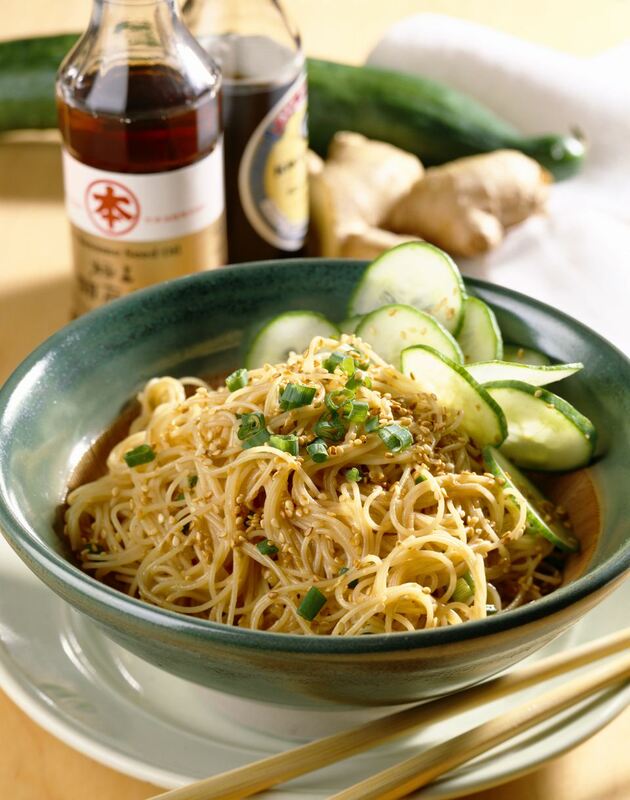 You may want to serve your noodles topped with extra fresh sliced cucumber.